Collin Sexton proved to be a dynamic scoring point guard during his freshman season at Alabama. He entered college as a highly touted recruit (#6 RSCI, McDonald’s All-American) and was immediately the best player on his Alabama squad. Entering the 2018 Draft, Sexton is our 10th ranked player in PSNP, and the 4th ranked guard behind Luka Doncic, Trae Young, and Shai Gilgeous-Alexander. Our role probability model indicates that Sexton’s most likely role will be as a starter in the NBA (41%), but it also gives him a wide range of outcomes from All-Star (30%) to not making it in the NBA (11%). Minnesota fans will likely remember Sexton from his performance in one of the strangest college basketball games in recent memory. Early in the season, the Minnesota Gophers were playing against Alabama when a scuffle broke out near the Alabama bench. In an unusual move, the referees ejected the entire Alabama bench leaving the Crimson Tide with just 5 players. After this, Alabama guard Dazon Ingram fouled out, and shortly after that John Petty injured his ankle on a jump shot. Alabama was left with just three players to take the court, and this is when things got weird. Collin Sexton caught fire and nearly led Alabama back from an 11 point deficit. In fact, Alabama outscored the Gophers during the stretch despite being forced to play 3 on 5! Sexton was unbelievable in the game, finishing with 40 points on 12/22 shooting, 6 rebounds, and 5 assists. Sexton’s performance in this game was a microcosm for the rest of the season, showcasing his relentless attacking style and never-say-die mentality, which is something that statistical models might not capture. Our models project Sexton to score at a very high rate in the NBA, primarily via attacking the rim, mid-range, and getting to the line. 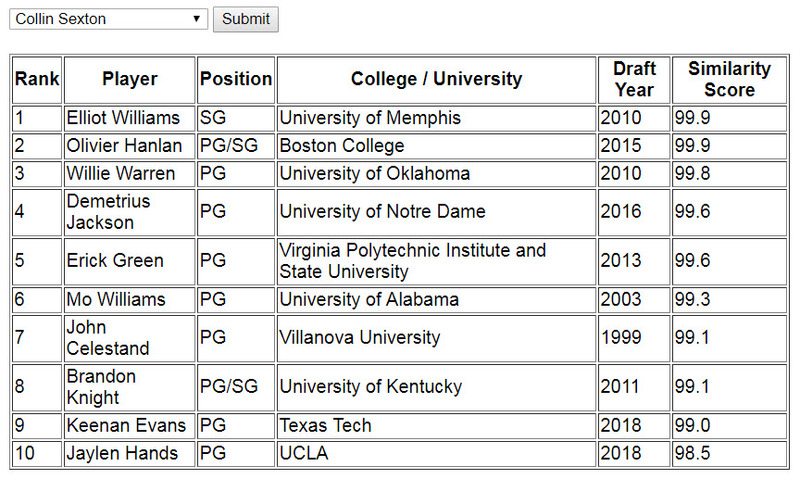 While some of the players on the list above did develop into good three point shooters (Walker, Martin, Gordon), our models project Sexton to be a below average three point shooter for a guard. Sexton averaged a respectable 3.6 assists per game in his freshman season. He was not a great passer, but showed the ability to draw extra defenders on drives and find the open man. Our models project him to be an average play-maker for an NBA guard. Like many freshman guards, Sexton showed inconsistent decision making. He was careless with the basketball at times, and his assist to turnover ratio was low at 1.29. Sexton’s shot selection was erratic, often forcing too many contested jumpers. Part of this was due to the fact that Sexton was the main source of offense on his team and was often forced to create his own shot at the end of the shot clock. His frame (6’3″, 190 lbs) and long reach (wingspan of 6’6.5″) provide him the tools to be a solid defender at his position in the NBA, but he does not posses the elite size that will allow him to effectively switch on picks and guard multiple positions. Sexton has the reputation as a scrappy, tough defender but his defensive metrics at Alabama were not great. He averaged just 0.8 steals per game and 0.1 blocks per game. His Defensive win shares of 1.2 placed him 495th among all guards with at least 500 minutes. Our models project him as a below average NBA guard in terms of blocks and steals. However, It is important to note that perimeter defense is a difficult skill to quantify; blocks and steals don’t always tell the whole story! Whatever team that drafts Sexton will likely hope that his promising combination of length, athleticism, and competitiveness will be enough to make him a good defender. Most of the players who compare closely with Sexton are high scoring guards who also posted high usage rates in college. None of these players were very good defenders (or even above average) at their position in the NBA. Many of Sexton’s comparisons are players who either didn’t make it in the NBA or played in a limited role. Mo Williams and Brandon Knight are the most recognizable names for NBA fans. While Brandon Knight was never an All-Star he was a decent scorer as a pro. He averaged 19.6 points per game in 2016 for the Phoenix Suns. Mo Williams carved out a pretty successful career in the NBA and even made the All-Star team in 2009. He developed into a very good perimeter shooter, shooting over 38% from three-point range over his career. Collin Sexton’s most valuable skill is his quickness and driving ability. Players who can break down the defense and draw help defenders are valuable because they can put the defense into a scramble that usually results in a high quality shot. Sexton was a high-volume scorer in college but he will likely not take on as much responsibility on offense in the NBA. According to our models, he should excel at scoring from within the arch and from the free throw line. Three-point shooting is a growth area for Collin Sexton. Our models indicate that he will be a below average shooter, but if he can shoot well enough to keep defenders honest, that will improve his effectiveness as a driver. Collin Sexton wasn’t a great defender in his freshman season, but he has the physical tools to become a good defender at his position in the NBA. Whatever team drafts Collin Sexton will be getting a fun, athletic guard who has a good chance at develop into an effective starter. It will be interesting to see how NBA teams value a primary ball handler who does not project as a good shooter. It didn’t stop De’Aaron Fox from going in the top 5 last year, but we continue to see NBA teams struggle at times when they are built around a guard of Sexton’s mold.